Though slightly more enjoyable than Piero Vivarelli’s other fumetti adaptation, Satanik, the wandering and episodic screenplay, nonetheless, might make Mister X a little hard to watch for some. 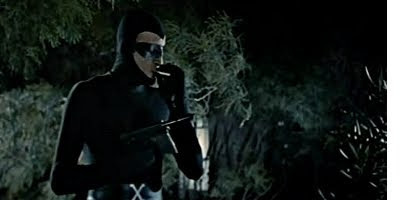 Pier Paolo Capponi of Forbidden Photos is still likably entertaining as a cigarette smoking, master-of-disguise superhero, demonstrating with a simple disguise in one instance an ability to not only fool a police inspector that happens to have a bull’s-eye for him but the viewer too. Danger: Diabolik it is not, but in the right mindset the film can be almost as fun. Though like in Phenomenal, there feels like a lack of costume use, as it takes some time before Norman Clark finally breaks out the superhero gear, but when he does, it still ends up being fun to watch, despite the fact that in this case the suit almost seems pointless. The title character seems to like explosives, which results in an unexplainable impulse from viewers to shout ‘boom’ seconds before every predictable explosion when Mister X takes out his unknowing foes.